Almond Crescent Cookies come in many varieties. They may also be called almond horns. Some are made with almonds or almond paste and no flour, and they're traditionally gluten free. They show up on the dessert trays of many countries, where they are favorites especially at Christmas. Varieties include Provençal crescents from the south of France, which have glacé fruits in them, and German almond crescents dipped in chocolate. The recipe below is much simpler, and is made with prepared almond paste. Be sure to check labels when you buy almond paste , as many brands contain gluten. Cut each roll into twelve 3/4 inch pieces, and roll into balls. 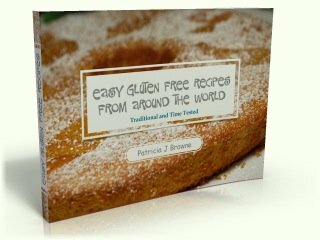 Get an eBook of easy gluten free recipes just for signing up for my FREE monthly ezine.